I’m very stoked about the ps4!! Sony needs testers for the new PlayStation 4. You will get to keep the new PS4 after you’ve tested it. We will contact the winners through Facebook. 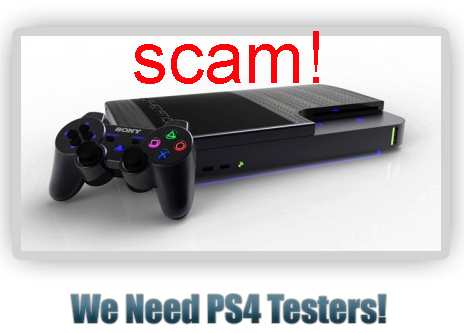 If you want to be a tester for the new PS4, you must share this photo and like our page. We will choose people at random in 1 week. This scam is hugely viral at the moment and being shared like crazy. The page has garnered almost 30 thousand likes, and the photo has been shared over 65 thousand times. Sony needs testers for the new PlayStation 4. You will get to keep the new PS4 after you’ve tested it….. 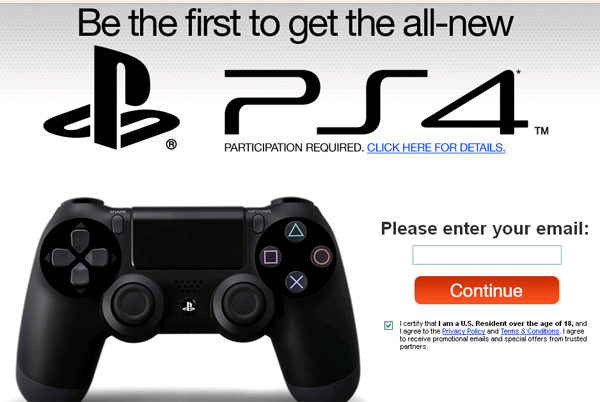 If you want to be a tester for the new PS4 just share this photo and like our page. Then go here: http://bit.ly to fill our your details if you don’t fill out your details we can’t send you the PS4. People will be chosen completely at random! This is just like all of the bogus offers we have seen before. You are required to complete a total of 10 featured and reward offers. This is a marketing gimmick, and should be avoided.